One goal of your consultation is to develop a facility plan. You want an in-depth evaluation of your ministries, staffing, facilities, and finances and an integrated, step-by-step plan for removing barriers to healthy growth and effective ministry . WHAT DOES YOUR CHURCH REALLY GET? If your church goes through an Integrated Planning Consultation, what payoffs can you expect? In nine cases out of ten, the church will end up with a facility plan that shows how you can accommodate growth, in phases, to double your present attendance. If we determine that it is impractical or inadvisable to grow to this size at your present site, we will help you evaluate other options--relocating, becoming multi-site, and church planting. Occasionally, for a church to accommodate 100% growth requires future decisions that the church is not ready to make. If processing such decisions now would distract the church from its primary focus of enhancing ministry, we identify the options and when the decision will need to be made, then try to focus the church on the immediate action steps needed to promote health and growth. 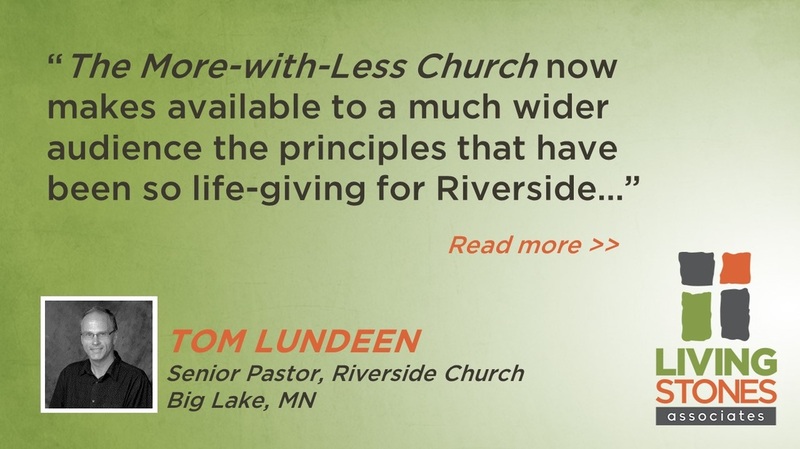 Your facility plan will embody "More-with-Less Church" principles–showing you how to accommodate maximum growth with minimal investment in bricks and mortar while maintaining (or restoring) excellence in quality. Typically, a single-use facility can be made to work well for a congregation at least three times the size for which it was originally designed. For example, a facility designed for 350 can usually be made to work well for a congregation of 1000 or more through utilization changes, remodeling, and modest additions before a major building program is needed. As compared to traditional facility plans, our approach to facility planning saves most churches hundreds of thousands, or (with larger congregations) millions of dollars, provided the church implements the plan. Because the Living Stones approach to facility planning reduces and postpones the need for building, churches that implement it are often able to get out of debt and stay out of debt, even through a major building program. For heavily indebted churches, the transition from a debt economy to a cash economy takes years. You will receive an analysis of your giving level and your giving potential. You will receive an analysis of your budget priorities and recommendations for which areas need increased investment and any areas that may be taking too much of the budget pie. If applicable, we will give you guidance on establishing a growth fund out of which future growth needs, including facility needs, will be funded. Our goal is to help you meet future growth needs with little or no debt so that money that would otherwise have been spent on interest can be invested in ministry to people. Learn best practices that stimulate generosity in your congregation. You will have a staffing plan that identifies any areas in which you are understaffed or inappropriately staffed including prioritized recommendations for optimizing staff effectiveness. This covers not only pastoral and program staff, but also office support and facility staff. Staff vacancies provide a valuable opportunity for considering restructuring, redefining, or redistributing staff assignments to optimize effectiveness. Concerns you raise about competence of present staff are typically handled privately with the senior pastor and/or your personnel committee. If applicable, we will provide you with guidance and coaching for the process of beginning or continuing the transition from the traditional "minister for hire" model of church staffing to the more biblical "equipper of ministers" model. You will know what your Natural Church Development (NCD) Minimum Factor is and your consulting team will have worked with you to identify why this is your minimum factor. Your leadership team will have experienced (on Saturday of the site visit) a session of teaching and vision-casting helping them to understand what the church's primary ministry focus needs to be for the coming year to strengthen your minimum factor. You will have in place a Church Health Team to prioritize and facilitate the implementation of the ministry recommendations growing out of the consultation. Your Ministry Coach (a member of your consulting team) will be connecting you with equipping resources to improve ministry effectiveness, especially in the area of your minimum factor. Provided you implement the major recommendations, your church is almost certain to be measurably healthier a year after the original site visit. Eighty-five percent of churches, upon taking their second NCD survey, show measurable improvement in church health. By the time you receive your written report, you will have a clear description of what immediate barriers to﻿ healthy growth your church faces in four areas ministries, staffing, facilities, and finances. Plus your plan will anticipate future barriers to growth, especially in facilities and staffing, and recommend ways to remove these barriers before they hinder ministry. These recommendations will be prioritized. A planning consultation "fast tracks" the church's planning process. Even if your board is qualified to do planning of this nature, a planning consultation can accomplish in a few months what would otherwise require five years or more of board planning. Note: Receiving full value from an Integrated Planning Consultation depends on being willing to use your facilities differently. Recommendations may include schedule changes, programming changes, relocating functions, converting single-use space to multiple-use space, and doing more ministry off-campus. Such recommendations are based on optimizing use of your facility, and, even more important, increasing ministry effectiveness. If your congregation is not open to such options, you are not ready for a Living Stones consultation.